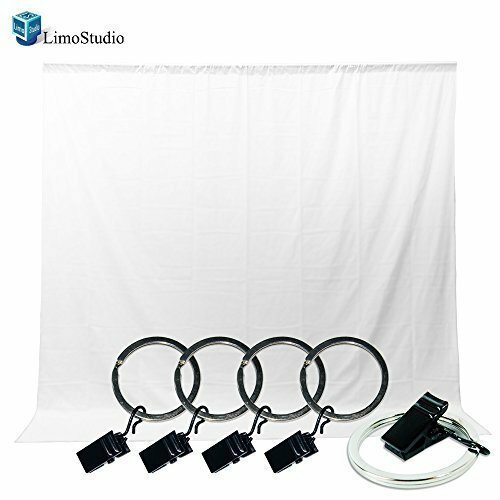 Home › Energy-Efficient LED Lighting › Limostudio Photo Video Photography Studio 5X10Ft White Muslin Backdrop Backgr..
Limostudio Photo Video Photography Studio 5X10Ft White Muslin Backdrop Backgr..
(1) x 5' x10' White Backdrop Screen Size : 5 x 10 ft. This Backdrop made by fabricated material Reflective and None Gloss surface. Simply dust off the surface and should be ready for reuse. Lightweight fabric and wrinkle-resistant. (5) x Backdrop Holders (Backdrop Helper) Used on crossbar (Diameter : 28mm). Maximum load:5lbs. This Backdrop Helpers are essential for hanging muslin, or other clothbackgrounds. It's nice for stretching out the wrinkles from muslin backgrounds. Disclosure: Part(s) and/or design is subject to change without notice for better performance.